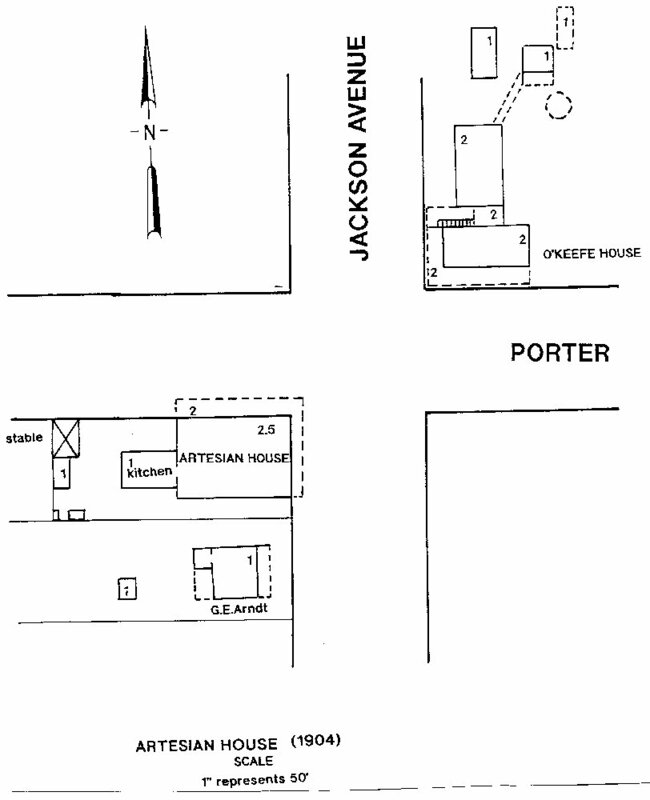 The Artesian House was located on the southwest corner of Jackson and Porter Avenues in Lot 8 of Block 31 of the Culmseig Map (1854) of Ocean Springs. The Artesian House was built in the Queen Anne architectural style. It was a two-story wood frame structure with an area under roof of 4,320 square feet. An eight-foot wide gallery facing north and east was present on both floors. The kitchen was attached to the rear of the building and had an area of 486 square feet. Located to the rear of the main structure was a small cabin of approximately 300 square feet. North of the cabin there was a small stable of 240 square feet which faced Porter Avenue. The Artesian House, sometimes called the Artesia House, was built by Alfred E. (Fred) Lewis (1862-1933) probably early in 1891. A notice in the Biloxi Herald of November 8, 1890 stated, "Mr. Fred Lewis is to build a large hall with store underneath just opposite O'Keefe's Hotel". This date is corroborated somewhat in The Pascagoula Democrat-Star of March 11, 1892 by the following, "Mrs. D.D. Cowan's grocery business has been removed to the "Lewis Building" on the corner of Jackson and Porter Avenue where she will also keep boarders". By the day, week or month. Meals served at any hour on the European plan. Mrs. Lillie L. Cowan (1862-1892), the wife of educator, D.D. Cowan, passed on July 28, 1892. Her occupancy of the Lewis Building was short lived. Fred Lewis was the son of Colonel A.E. Lewis (1812-1885), a pioneer settler of Jackson County. The elder Lewis was active in commerce and politics serving as Sheriff for fourteen years, and in the Mississippi State Legislature from 1850-1852. He built Oldfields Plantation (1845) on the Mississippi Sound at Gautier where he raised stock, fruit trees, and crops. Fred Lewis was married to Julia Johnson (1861-1933). Their Alabama born adopted daughter, Marguerite Lewis (1890-1961), married Frank Raymond (1883-1952) who owned the Pines Hotel at Ocean Springs from 1925-1929. Fred Lewis like his father was active in politics, commerce, and served as the chief oyster inspector for the Mississippi Seafood Commission. He also owned the water works at Ocean Springs. Lewis supplied the town with artesian water from a well about 500 feet deep. The well, tanks, and other equipment were located on a lot between Washington Avenue and Church Street just northwest of the Munro Shell Station on Bienville Boulevard. the Comforts and Conveniences of a Modern Hotel. Another beautiful hotel at Ocean Springs is the Artesia House, which is a modern structure in every sense of the word and contains all the comforts of home. Being the last hotel built at Ocean Springs, it naturally has many advantages over the older ones in the way of modern improvements. It is built on the Queen Anne style and is right in the center of the city. Its ceilings are high and the rooms large and airy. It is the property of Mr. E.J. Morris, an enterprising gentleman of Ocean Springs, who has done much to advance the interest of the place. He is a large real estate owner and the best informed man of that topic in the city. By the fall of 1900, S.J. Anderson had rented the Artesian House to J.C. Dearborn who took possession in November. November also saw Professor Q.D. Sauls become a tenant, and Casper Vahle in a dispute with the Andersons probably over his lease. Captain John Johnson also lived here before moving to Biloxi after he lost $800 when 700 barrels of his oysters froze. The temperature had plummeted to one degree Fahrenheit on February 13, 1899. The Andersons changed the name of the hostelry to the Oak View Hotel in 1904 or 1905. This fact is corroborated by a notice on January 30, 1904, when The Ocean Springs News reported that, "J.L. McDaniel has rented the lower floor of the Knights of Pythias building and moved his fruit and vegetable stand from the Artesian House". A notice in The Pascagoula Democrat-Star of September 1, 1905 referred to it as the Oak View Hotel. The Andersons would run the hotel for over twenty years. Mrs. Caroline Anderson was born at New Orleans in 1873. Her father was Eugene Gaspard, a native of France. She and S.J. Anderson married circa 1889 and had two children: Malvina J. Bernard Cotter (1890-1954+) of Eddy County, New Mexico and Frank Sidney Anderson (1893-1923+). Children: Catherine G. Buendia (1954)? of NOLA, Frank Sidney Anderson, Jr. of Napa Co., Calf., and Doris Jean Lewis (1954+) of Harris Co., Texas?. S.J. Anderson had a frightening experience in the Hurricane of October 1915. During the tempest, his schooner was anchored at the New Basin in New Orleans. Anderson went to check on his vessel with winds roaring at one hundred miles per hour. He boarded the floundering boat and threw out double anchors to secure it. As he was about to leave the vessel, the wind hurled the roof of a cotton warehouse upon the schooner falling both masts and narrowly missing the anxious Anderson. He also lost a schooner in the Rigloets Marsh. or to S.J. Anderson, Vancleave, phone 109-2. By December 1915, the name of the Oak View Hotel had been changed to the Anderson Apartments. On December 2, 1915, The Ocean Springs News described this enterprise as: Each apartment consists of two rooms, with all appurtenances for light housekeeping; also bath, electric light, and telephone service. These apartments, ten in number, are centrally located, and should appeal to our visiting friends, wishing to spend a season in our delightful climate, and enjoy all the comforts of home, with the charming hostess, Mrs. Anderson, who spares nothing for the comfort of her patrons. In late September 1917, the Andersons went to Hot Springs, Arkansas as Mr. Anderson's health was failing. Unfortunately, he died there on October 3, 1917. Anderson's remains were sent to New Orleans for interment in the Greenwood Cemetery. The funeral was held at the home of H. Moskan at 2713 Bienville Street. Moskan was the brother-in-law of Sidney Anderson. The Crescent City Realty Company, a Louisiana Corporation, was represented at Ocean Springs by W.J. Hardke (1877-1932) and John Leo Dickey (1880-1938) both natives of Niles, Michigan. There was a rumor at this time that a colony of twenty-one families from Niles, Michigan would move to Ocean Springs. Some were to reside at the Anderson Apartments. During the Crescent City Realty Company's proprietorship, the name of the hostelry was changed to the White House. The Jackson County Times of August 25, 1925, reported that E.E. Woodford recently purchased the Anderson Apartments. Victor Toche (1887-1962) painted the building, and Woodford, who probably had a lease on the property, named the edifice, The White House Apartments. Woodford may have employed Mrs. L.A. Elwyn, who was born at Indiana in 1882, as the resident manager. Crescent City Realty lost their Jackson Avenue property when they defaulted on a deed of trust held by Lester F. Alexander of New Orleans. Lester F. Alexander was a partner with John Leo Dickey. Their company, the Lester F. Alexander Construction Company, specialized in river engineering projects such as, jetties, docks, and locks. In June 1922, Dickey purchased "Bay View", the Christian Hanson (1845-1914) home off Shearwater Drive, which he renamed Shadowlawn. Another landmark in Ocean Springs will soon disappear. The White House is being demolished by Charles Braun of Biloxi. This building a large two-story structure was built in the early nineties at a cost of about $5000, when lumber and labor were cheap. It was sold to the wrecker for $300. The material is all heart lumber and most of it is in perfect condition. We believe the lumber will be moved to Biloxi. Mrs. L.A. Elwyn has occupied the place for the last nine years. Ray L. Bellande, "The Hanson-Widmer House", (unpublished essay), March 1993. C.E. Schmidt, Ocean Springs French Beachhead, (Lewis Printing Services: Pascagoula - 1972), p. 63. The History of Jackson County, Mississippi, "Lewis Family", (Jackson County Genealogical Society: Pascagoula, Mississippi-1989), p. 265. The History of Jackson County , "John and Jennie Dickey", (Jackson County Genealogical Society:Pascagoula, Mississippi-1989), p. 190. Jackson County Chancery Court Cause No. 4390, “W.T. Burt Company v. Caroline J. Anderson”, October 31, 1923. Jackson County, Mississippi Land Assessment Roll (1902), "A.E. Lewis", pp. 199-200. The Biloxi Herald, November 8, 1890, p. 4. 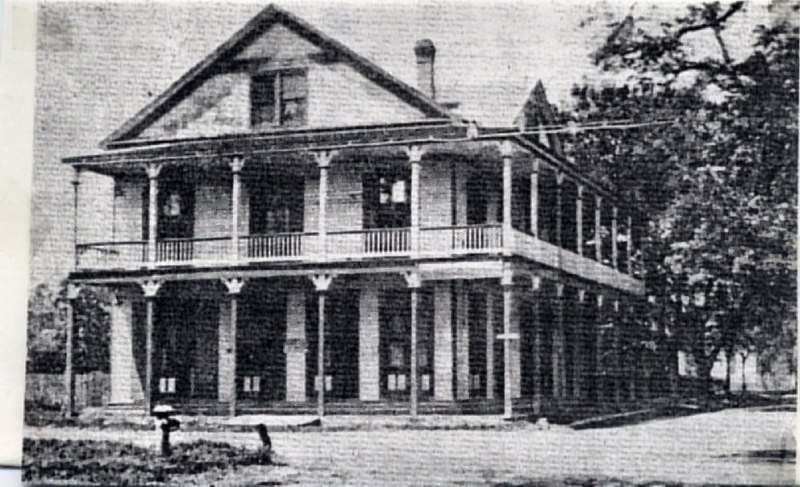 The Biloxi Herald, “The Cowan House”, (advertisement), May 7, 1892. The Biloxi Daily Herald, February 21, 1899, p. 8. The Biloxi Daily Herald, January 13, 1900, p. 8. The Daily Herald, "Sidney Anderson, 50, Dead", October 5, 1917, p. 6. The Jackson County Times, “Local and Personal”, June 6, 1925. The Jackson County Times, “Local and Personal”, June 27, 1925. The Jackson County Times, "Local and Personal", August 15, 1925. The Ocean Springs News, “Local News”, January 8, 1910. The Ocean Springs News, “Local News”, March 19, 1910. The Ocean Springs News, “Local News”, June 10, 1911. The Ocean Springs News, "Anderson Has Narrow Escape From Death", October 7, 1915, p. 2, The Ocean Springs Record, photo of "Anderson Apartments", January 2, 1969, p. 11. The Pascagoula Democrat-Star, "Ocean Springs Locals", February 23, 1894. The Pascagoula Democrat-Star, "Ocean Springs Local", November 3, 1899. The Pascagoula Democrat-Star, "Ocean Springs Locals", November 17, 1899. The Pascagoula Democrat-Star, "Ocean Springs Locals", September 21, 1900. The Pascagoula Democrat-Star, "Ocean Springs Locals", November 2, 1900. The Pascagoula Democrat-Star, “Ocean Springs Locals”, November 9, 1900. The Pascagoula Democrat-Star, "Ocean Springs Locals", March 31, 1905. The Pascagoula Democrat-Star, September 1, 1905, p. 3. The Pascagoula Democrat-Star, “Local News”, December 1, 1905. The Progress, "Local News Items", March 5, 1904. The Progress, “Local News Items”, May 14, 1904. Sanborn Map Company (New York), "Ocean Springs, Mississippi", (1904)-Sheet 2. US Census - Jackson County, Mississippi (1880, 1900, 1910, and 1920).